Chitranjali Negi participated as Key note speaker on E- Courts: ODR in Indian Judicial System. Chitranjali Negi, Advocate at Supreme Court of India and ODR Researcher, was the Key note speaker on E- Courts: ODR IN INDIAN JUDICIAL SYSTEM". 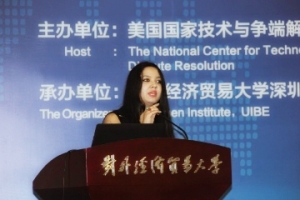 The Conference was hosted by the National Center for Technology & Dispute Resolution, organized by Shenzhen Institute University of International Business & Economic (UIBE), co- organized by China Internet Association Mediation Center and Collaborative Innovation Center for China's Multinational Enterprise. The 16th International Forum on Online Dispute Resolution hosted by the National Center for Technology and Dispute Resolution and co-organized by the Shenzhen Institute of the University of International Business and Economics was held on September 18 - 19 at the university campus.This conference continued the theme “Innovative, Invigorated, interconnected, inclusive” proposed by the G20 summit, and discussed the application of information technology in dispute resolution. This conference was a top-ranked academic conference in ODR held in China for the first time, which fully reflected China’s status in rule making of the international order.